Prosper Henry discovered asteroid #125 Liberatrix. C. H. F. Peters discovered asteroid #202 Chryseis. A. Charlois discovered asteroid #317 Roxane. M. Wolf and A. Schwassmann discovered asteroid #435 Ella; M. Wolf discovered asteroid #434 Hungaria. P. Gotz discovered asteroids #543 Charlotte and #544 Jetta. A. Kopff discovered asteroids #646 Kastalia, #647 Adelgunde, #648 Pippa and #649 Josefa. Max Wolf rediscovered Halley's comet. K. Reinmuth discovered asteroids #1628 Strobel and #1662 Hoffmann. P. Shajn discovered asteroids #1120 Cannonia, #1121 Natascha and #1610 Mirnaya. K. Reinmuth discovered asteroid #1759 Kienle. P. Shajn discovered asteroid #1987 Kaplan. NASA's Surveyor 5 made a soft landing on the Moon, returned pictures of the surface, and made the first chemical analysis of Lunar material. P. Wild discovered asteroids #1891 Gondola and #2029 Binomi. Two major directions were identified for NASA's manned space flight in its next decade - continued Lunar exploration, and developing a permanent presence in low Earth orbit supported by a low-cost shuttle. USSR Luna 18 crashed into the Lunar surface while attempting a soft landing in rugged mountainous terrain near Mare Fecunditatis at 3.57 N, 50.50 E (selenographic coordinates). N. Chernykh discovered asteroids #1907 Rudneva, #1908 Pobeda, #2113 Ehrdni, #2164 Lyalya, #2178 Kazakhstania and #2238 Steshenko. USSR launched Raduga 2 from Baikonor to provide telephone and telegraph service in the USSR, and transmit USSR Central Television programs to stations in the Orbita network, positioned in geosynchronous orbit over the Indian Ocean at 86 deg E.
N. Chernykh discovered asteroids #2428 Kamenyar, #2458, #3054 Strugatskia, #3224 Irkutsk and #3302. 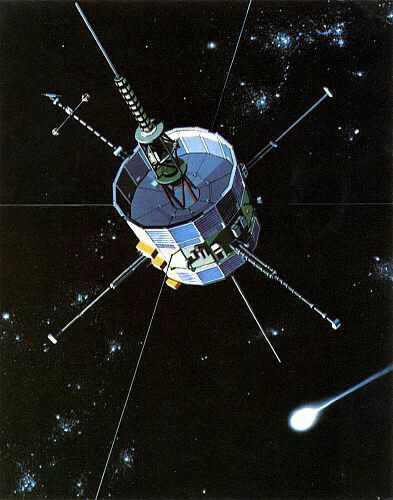 USSR launched Cosmos 1305 into orbit from Plesetsk, a Molniya-3 communications satellite. H. Debehogne discovered asteroid #3646. NASA's ISEE 3/ICE (International Sun Earth Explorer/International Cometary Explorer) probe traversed the plasma tail of Comet Giacobini-Zinner within 7900 km of its nucleus, the first-ever comet flyby. During the 5h 44m Mir EO-12-3 EVA, cosmonauts Solovyov and Avdeyev completed the installation of the VDU thruster pod on the Sofora tower on the Mir space station. McDonnell-Douglas launched a DC-X test mission from White Sands, New Mexico, as an ascent and landing mode control and ground effects survey, which reached a 92 meter altitude in its 66 second flight. Soyuz TM-21 landed with the crew of Budarin and Solovyov aboard, returning from the Mir space station. An Ariane 42P launched from Kourou carried the Echostar 2 communications satellite to space, which was positioned in geosynchronous orbit at 119 deg W.
During the 6h 14m STS-106-1 EVA, astronauts Lu and Malenchenko rode the shuttle Atlantis' RMS arm to the Zvezda ISS module and began installing cables, reaching a distance of 30 meters from the airlock when installing Zvezda's magnetometer. Suicide hijackers crashed two airliners into and destroyed the World Trade Center in New York City, and a third plane into the Pentagon in Arlington, Virginia, damaging it heavily, in the first use of civilian aircraft as weapons of mass destruction.